A leading futurist offers an inspiring portrayal of how new technologies are giving individuals so much power to connect and share resources that we are entering a new era in which networks of individuals, not big organizations, will solve a host of problems by reinventing business, education, medicine, banking, government, and scientific research. A renowned futurist offers a vision of a reinvented world. 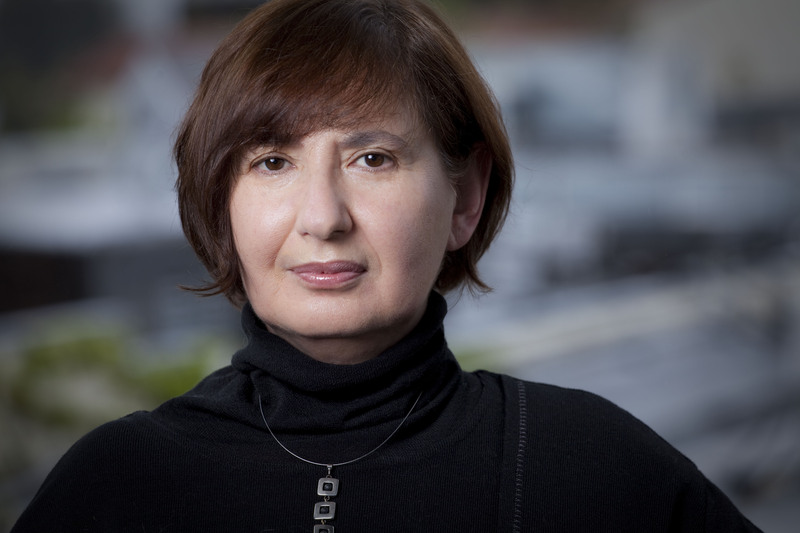 As Silicon Valley thought-leader Marina Gorbis, head of the Institute for the Future, portrays, a thriving new relationship-driven or socialstructed economy is emerging in which individuals are harnessing the powers of new technologies to join together and provide an array of products and services. Examples of this changing economy range from BioCurious, a members-run and free-to-use bio lab, to the peer-to-peer lending platform Lending Club, to the remarkable Khan Academy, a free online-teaching service. These engaged and innovative pioneers are filling gaps and doing the seemingly impossible by reinventing business, education, medicine, banking, government, and even scientific research. Based on extensive research into current trends, she travels to a socialstructed future and depicts an exciting vision of tomorrow. How was my mother able to provide all these things on the meager salary of a physician in a government-run clinic in Odessa, Ukraine? Social connections were a powerful currency that flowed through her network of friends and acquaintances, giving her access to many goods and services and enabling our comfortable, if not luxurious, lifestyle. Even when no meat could be found in any store in the city, my mother was able to get it, along with a wealth of other hard-to-find foods, from the director of the supermarket who was the husband of a close colleague of hers. I was accepted into music school because my mother treated the director of the school in her off-hours. We were able to get Western medicines because a friend was the head of a large local pharmacy. Our story was not unique. All around us, amid empty stores, low salaries, dismal productivity numbers, and fraying infrastructure, people seemed to live normal middle-class lives. An economist would have had a hard time explaining our lifestyle by analyzing economic statistics or walking around the stores and markets in Russia in the 1960s and 1970s. In fact, visitors to the Soviet Union always marveled at the gap between what they saw in state stores—shelves empty or filled with things no one wanted—and what they saw in people’s homes: nice furnishings and tables filled with food. Today, all around the world, we are seeing a new kind of network or relationship-driven economics emerging, with individuals joining forces sometimes to fill the gaps left by existing institutions—corporations, governments, educational establishments—and sometimes creating new products, services, and knowledge that no institution is able to provide. Empowered by computing and communication technologies that have been steadily building village-like networks on a global scale, we are infusing more and more of our economic transactions with social connectedness. We are moving away from the dominance of the depersonalized world of institutional production and creating a new economy around social connections and social rewards—a process I call socialstructing. Others have referred to this model of production as social, commons-based, or peer-to-peer.1 Not only is this new social economy bringing with it an unprecedented level of familiarity and connectedness to both our global and our local economic exchanges, but it is also changing every domain of our lives, from finance to education and health. It is rapidly ushering in a vast array of new opportunities for us to pursue our passions, create new types of businesses and charitable organizations, redefine the nature of work, and address a wide range of problems that the prevailing formal economy has neglected, if not caused. Socialstructing is in fact enabling not only a new kind of global economy but a new kind of society, in which amplified individuals—individuals empowered with technologies and the collective intelligence of others in their social network—can take on many functions that previously only large organizations could perform, often more efficiently, at lower cost or no cost at all, and with much greater ease. Socialstructing is opening up a world of what my colleagues Jacques Vallée and Bob Johansen describe as the world of impossible futures, a world in which a large software firm can be displaced by weekend software hackers, and rapidly orchestrated social movements can bring down governments in a matter of weeks. The changes are exciting and unpredictable. They threaten many established institutions and offer a wealth of opportunities for individuals to empower themselves, find rich new connections, and tap into a fast-evolving set of new resources in everything from health care to education and science. Much has been written about how technology distances us from the benefits of face-to-face communication and quality social time. I think those are important concerns. But while the quality of our face-to-face interactions is changing, the countervailing force of socialstructing is connecting us at levels never seen before, opening up new opportunities to create, learn, and share. Consider a few examples of amplified individuals who are pioneering this transformation. The team soon turned their garage into a biotech lab. They acquired most of their equipment from biotech companies that were going out of business and were willing to get rid of their gear for pennies on the dollar. Eri and John would sometimes drive to Los Angeles to pick up equipment and attend a biotech conference on the way. Word about their lab spread quickly. Many people came by to visit, among them Peter Thiel, a venture capitalist famous for his early investment in Facebook. Thiel decided to invest in Immune-Path,3 a start-up created by Schloendorn that specializes in stem cell therapeutics for diseases of the immune system. One of the projects developed by some of the members of the BioCurious community is an open PCR (polymerase chain reaction) machine. A PCR machine is critical for DNA analysis and is a foundational tool for virtually all of modern molecular biology research. Traditional PCR machines cost between $4,000 and $10,000, but two of the BioCurious cofounders, Josh Perfetto and Tito Jankowski, developed a PCR machine that sells for around $600. Along with Mac Cowell, a cofounder of DIYbio.org, another nonprofit dedicated to engaging people in biology research, Josh created another project called Cofactor Bio that sells kits to enable people to do all kinds of genetic and biological testing on their own.5 You can, for example, specify which genes you want to test for, such as the gene associated with quick metabolization of caffeine or the gene associated with natural marathon-running abilities, and they will send you a kit to do the testing. Paul had completed the investigation and was ready to publish his exposé in September 2001, but his story was pushed aside by the events of 9/11. Few people were interested in adoption scams involving Eastern Europe. When the story finally appeared as a lead article in the San Antonio Express-News in October 2001,6 it didn’t garner much attention. Nevertheless the experience taught Paul the value of local information and sources, the importance of doing painstaking and often boring forensic reporting work, and the long life that archived online stories can have, with direct impact occurring possibly years after a story is published. The creation of archives, databases, and software tools is a big part of the OCCRP effort. Paul’s hope is to establish a global information resource that will make it easy for not just skilled investigative journalists but also citizen journalists and others to participate in disrupting global organized crime. As he puts it, “For many years organized crime has been successful in exporting crime all over the world. Ponzi schemes, trafficking in persons, value-added tax fraud, carbon credits fraud, credit card skimming, and many other crimes have been exported from country to country while law enforcement and citizens were not prepared to confront them because they didn’t have enough information. Investigative journalists and databases created by investigative journalism organizations may act in a preemptive way in order to stop the migration of crime. This can be done through the construction of databases where [information on] individuals, organizations involved in crime, and emerging crime models would be stored and indexed so that crime syndicates would not be able to conduct business as usual.”11 Paul’s first lesson from Texas has proven invaluable: when information is properly archived, sourced, and indexed, it will have a lasting value in disrupting corruption. In 2002 David Evan Harris, like so many other college students, was spending his junior year abroad, traveling through Tanzania, India, the Philippines, Mexico, and the United Kingdom. In each of these places he lived with local families, sharing their intimate spaces and daily lives. He stayed in a bamboo house in the Philippines, a former squatter settlement in Mexico City, and a mansion in New Delhi. As with many young people having their first overseas adventure, the experience left an indelible mark on David. “I went from thinking of those countries as nations of abstract numbers of millions of people to thinking of them as individuals,”12 he says. Unlike many college students who return from abroad and go back to their regular lives, however, David parlayed his experience into a global social enterprise—part art project, part anthropological resource, part social movement. The Global Lives Project is a collaboratively built video library of human life experience. For its first major undertaking, the Global Lives team captured twenty-four continuous hours in the lives of ten people in different parts of the world. How were the ten people selected? In the early 2000s, David saw an email asking what the world would look like if it had only one hundred people. Based on proportional distribution, only one person would have a computer, only one would have a college degree, thirty-three would not have access to clean drinking water, and so on. When reading the emails, David was struck by the contrast between what he was reading and the demographics of his social network, mostly college-educated middle class Americans. It inspired him to select ten people who would be representative of the global population. For the first shoot, of James Bullock, a cable car operator in San Francisco, David’s collaborator was Daniel Jones of Kalamazoo, Michigan, someone David had met during his days as a climate change activist. Daniel had studied film and had gone on to get his first documentary production gig after college. The company he was working for went bankrupt, though, and instead of getting a severance paycheck he got a package of video production equipment. Daniel offered to fly to San Francisco to do the first shoot, and he and David split the cost of the airplane ticket plus gasoline and food expenses for the day. When the film was shot, Daniel edited it for the first DVD to be distributed to potential supporters. One of his friends, who worked at AOL at the time, created a website so they could show the film to people in other countries and invite them to participate. The next shoot took a while to organize, as David moved to Brazil to do graduate study in sociology. Not far from his apartment he stumbled upon the Museum of the Person, a museum of people’s life stories, with more than seven thousand stories captured on video, ranging from stories of rural farmers to stories of most of the recent presidents of Brazil. One of the directors of the museum, Jose Santos, became David’s mentor and supporter, along with others on the museum’s staff. The Museum of the Person not only agreed to coproduce a second Global Lives shoot in Brazil, the staff also connected David with partners in Japan and the United States. Since that time the Global Lives Collective has completed shoots in ten countries and has organized a number of exhibits around the world. Global Lives videos have been displayed as art installations in various museums, art spaces, and festivals, with footage of people’s lives around the globe playing simultaneously, inviting audiences to “confer close attention onto other worlds and simultaneously reflect upon their own.” The exhibits provide powerful immersive experiences for audiences, but what is equally instructive is how the videos themselves are created. For its first three years of operation, the Global Lives Project had no paid staff.14 Instead, hundreds of volunteers from around the world, who make up the Global Lives Collective, organized themselves to create the videos. These volunteers include filmmakers, photographers, programmers, engineers, architects, designers, students, and scholars. Collectively they have donated thousands of hours to bring this project into being. Online volunteers have subtitled all 240 hours of footage and translated them into English and other languages. Today Global Lives is a 501(c)(3) nonprofit organization with a shared office and only one full-time staff member, but it has a huge network of contributors creating an amazing archive of human life experiences globally. With the motto “Step out of your world” and a mission “to collaboratively build a video library of human life experience that reshapes how we as both producers and viewers conceive of cultures, nations and people outside of our own communities,”15 the project continues to attract more and more eager contributors. The range of ways in which individuals like Eri, Paul, David, and many others are creating value, developing new solutions, and providing new kinds of resources is breathtaking. These efforts are touching every domain of our lives. Take education as one example. Content that was once the purview only of credentialed teachers, accessible only in classrooms, and locked up in expensive textbooks is becoming accessible to everyone around the globe. It is available in free online encyclopedias like Wikipedia, in free courseware like MIT’s OpenCourseWare, and on platforms such as Academic Earth, which offers free online video lectures from such top-notch universities as University of California, Berkeley; Harvard; and Stanford. In addition, new tools and technologies are turning the whole world into a classroom, making learning possible anytime and anywhere. Think of a simple app on your iPhone such as Yelp Monocle.16 When you point the phone at a particular location, it displays “points of interest” in that location, such as restaurants, stores, and museums. But this is just the beginning. What if, instead of restaurant and store information, we could access historical, artistic, demographic, environmental, architectural, and other kinds of information embedded in the real world? This is exactly what a project from the University of Southern California (USC) and the University of California, Los Angeles (UCLA) called HyperCities is doing; it is layering historical information on the actual city terrain. As you walk around with your cell phone, you can point to a site and see what it looked like a century ago, who lived there, what the environment was like. Not interested in architecture? Passionate about botany and landscaping instead? The Smithsonian’s free iPhone and iPad app, Leafsnap, responds when you take a photo of a tree leaf by instantly searching a growing library of leaf images amassed by the Smithsonian Institution. In seconds it displays a likely species name along with high-resolution photographs of and information on the tree’s flowers, fruit, seeds, and bark. We are turning each pixel of our geography into a live textbook, a live encyclopedia. Developments such as these, which I’ll discuss more fully in the following chapters, are being replicated all around the world in many areas from space research to manufacturing, from banking to the arts. These initiatives may appear to be founded on a combination of passion, naïveté, and blatant disregard of the “real world,” so it is easy to dismiss them as marginal, only for the tech-savvy or the rebellious ones. But I invite you to look at this emerging world through the eyes of an immigrant, the eyes through which I look at the world. I came to the United States as an eighteen-year-old, young enough not to have been fully embedded in the social institutions and language of the adult life of work, family obligations, and worries of my home country but old enough to have devoured its history, literature, and thinking. Being an immigrant, I got used to feeling at home and yet slightly estranged in many places. Over the years, I have experienced my foreignness as both a blessing and a curse—a curse when no matter how hard I try, traces of my accent come through in a conversation. No introduction of mine ever skips the question, “So, where are you originally from?” I’ve come to appreciate my otherness only later in life, when I realized that it is precisely this otherness that allows me to question the conventional wisdom, “the way things have to be,” and “the right way to do things.” I bristle when I hear from “experts” that teenage rebellion is a normal part of adolescent development. Normal where? Maybe in the West, but not in many other parts of the world where young people do not have the luxury of an extended childhood or a desire to live in nuclear families. I laugh at scientific studies showing that girls are not as good at math as boys are. I never heard this growing up in the Soviet Union, with a sister who was a math whiz and surrounded by girls who were outperforming boys in math in high school. After college, while I was working in Europe for a refugee agency, a friend said to me, “You are like Pippi Longstocking. She always comes back from some faraway land and tells everyone how people there live differently.” I don’t think she meant the comment as a compliment, and I certainly viewed my foreignness more as something of a curse at the time. But in my work as a futurist, now directing the Institute for the Future in Palo Alto, California, I have come to view my immigrant history as a blessing. After all, we are all immigrants to the future; none of us is a native in that land. Margaret Mead famously wrote about the profound changes wrought by the Second World War, “All of us who grew up before the war are immigrants in time, immigrants from an earlier world, living in an age essentially different from anything we knew before.”17 Today we are again in the early stages of defining a new age. The very underpinnings of our society and institutions—from how we work to how we create value, govern, trade, learn, and innovate—are being profoundly reshaped by amplified individuals. We are indeed all migrating to a new land and should be looking at the new landscape emerging before us like immigrants: ready to learn a new language, a new way of doing things, anticipating new beginnings with a sense of excitement, if also with a bit of understandable trepidation. This book is about the new territory we are migrating to, the landscape of which is only beginning to emerge. In The Second Curve: Managing the Velocity of Change, the futurist and former president of the Institute for the Future, Ian Morrison, argues that any period of big technological transformation is characterized by two curves.18 The first is the incumbent curve: the way things have been done, the way we’ve organized before, often quite successfully. This curve may still show a reasonable pace of growth, and sometimes a lot of money can be made along this curve. Looking long term, however, this way of doing things is on the decline. Today this incumbent curve is the curve of institutional production, a model that has been dominant throughout the past century in which most value creation and resources were concentrated and flowed through large hierarchical institutions: banks, corporations, large universities. The second curve is the nascent one, and it is the curve of socialstructing, the new way of organizing our activities. Many socialstructed efforts have not yet achieved scale, and the activities on this second curve may seem to exist on the margins. We can see only signals of this emerging curve today, and many of the signals may appear strange and disorienting; they simply don’t fit into the way we have always done things. Yet we ignore these signals from the new land at our peril. They are beacons of the things to come, a land of exciting opportunity, open to us all. My core contention in this book is that the innovations rapidly emerging through socialstructing are not merely fringe developments but are the early manifestations of a new economy that will increasingly replace the institutional production we have come to rely on in so many areas of our lives. A number of industries are already being profoundly disrupted by the rise of socialstructing, such as publishing and the music business. Over time this emerging socialstructed economy will likely become mainstream, but that might be a long-term process. I believe we can all benefit right now, though, by learning about the ways the new economy is rapidly evolving and by taking part in it. A socialstructed economy may seem foreign to many now, but there is no reason for anyone to feel like a stranger in it. There is a place for everyone. Participation requires no special knowledge of technology. The tools for connecting have become so readily accessible, cheap or free, and so easy to use that anyone can learn to use them after brief immersion. We can find health and other kinds of traditionally expensive professional advice at low or no cost, find new avenues for creative expression and social connection, and engage in more meaningful work. But even more fundamentally, we can rekindle our basic human drive to be part of something larger than ourselves, something that isn’t primarily about profit-driven productivity, and can begin to restore the value of personal connections, and the sharing of our time, talents, and resources, to a central and deeply satisfying place in our lives. The institutional, corporate structure of our economy and the stripping out of the social and the distinctive human touch in production are relatively recent phenomena. We are well adapted to the more social, participatory way of doing things that is at the heart of socialstructing, despite how novel and daunting it may seem. This is one reason I am confident that current developments will go mainstream. As I explore in the next chapter, we have now achieved something of a perfect storm of technologies: we have built a deep technology infrastructure for mass participation and collaboration, at the same time robotics and automation technologies are taking humans out of most rote tasks, not only in manufacturing but also in the service economy, making more and more of the traditional jobs we’ve relied on obsolete. Now is the right time for all of us to understand the potential of the new socialstructed world emerging and to begin participating in it. Marina Gorbis is Executive Director of Institute for the Future, a nonprofit research and consulting organization based in Silicon Valley. She has consulted to hundreds of organizations in business, education, government, and philanthropy. She has been a repeated guest blogger on BoingBoing.net and is a frequent speaker on future organizational, technology, and social issues. She holds a masters degree from the Graduate School of Public Policy at UC Berkeley. "There's no better futurist to learn from today than Marina Gorbis, who taps her vast social network of innovators and researchers for the biggest, most disruptive ideas that are changing how we work, solve problems and create value today. This book is a thrilling and insight-packed guide to harnessing the power of the new social economy. It's full of compelling stories and practical lessons from on-the-ground visionaries who are inventing the future as we speak. This book will help you see the next century clearly -- and maybe even turn you into one of the amazing SocialStructers who are changing what's possible for the rest of us." 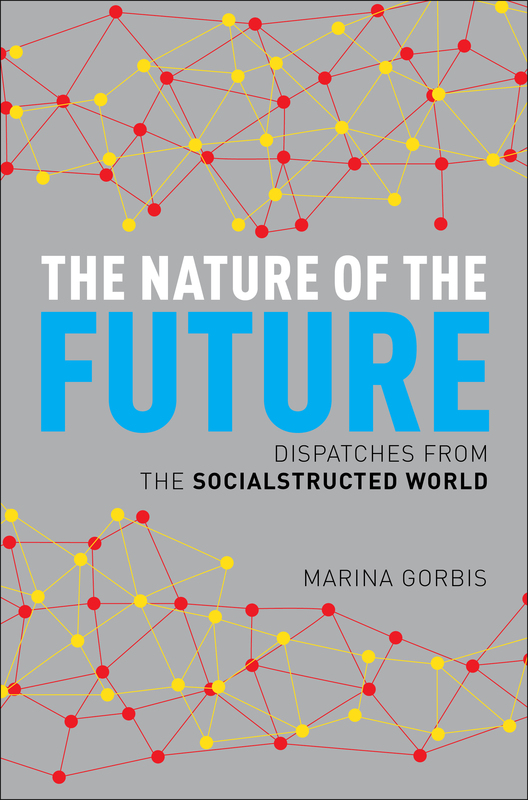 "Marina Gorbis is the only futurist I know capable of explaining and connecting phenomena such as alternative currency, deliberative democracy, bio-citizenry, and socialstructs - all in a language that even a CEO can understand. This is the context that companies and organizations of all kinds need to thrive in the emerging social landscape." – Douglas Rushkoff, author of Present Shock and Program or Be Programmed. "Marina Gorbis's book The Nature of the Future reminds me of one of my favorite Einstein quotes. "You can't solve a problem from the same consciousness that created it. You must learn to see the world anew." This book outlines the new ways to rethink the social structures of the world. Every participant in this global reality needs to read this book." "We can now begin to see that the most important long term effect of computers and the Internet are the ways these tools enable people to do things together in entirely new ways. Large and small groups all over the world are using collaborative, digitally mediated methods of "socialstructing" to amplify and reinvent money, scientific discovery, governance, education. Marina Gorbis' experience as Executive Director of Institute for the Future positions her perfectly to foresee and forecast the emerging social economies that are already changing the way people get things done together. You'll learn a lot from this book. More importantly, you'll gain a powerful new lens for seeing what is really going on around us." "Marina has just published a compelling, provocative, and grounded book about how technology is enabling individuals to connect with one another to follow their passions and get stuff done, outside of large corporations, governments, and the other institutions that typically rule our lives. Marina calls it "socialstructing." I call it making the future better than the present."